There’s quite a bit of heavyweight news today: firstly Tyson Fury has his next fight (almost certainly) set, against unbeaten but largely untested Tom Schwarz, and Oleksandr Usyk, the first man in history to have collected all four major belts at cruiserweight, has his heavyweight debut opponent set (almost certainly). According to top scribe Mike Coppinger, southpaw Usyk will face battle-hardened and experienced contender Carlos Takam, in Chicago on May 18 (the night WBC heavyweight ruler Deontay Wilder faces the challenge of Dominic Breazeale in New York). 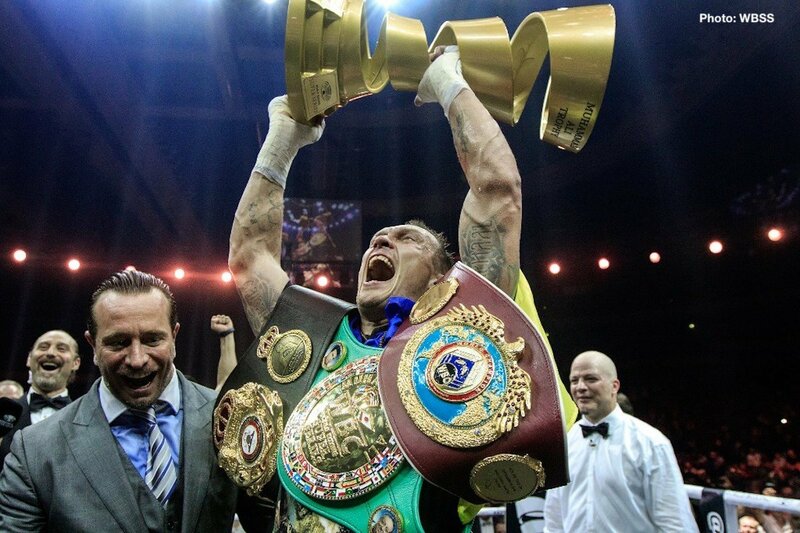 32 year old Usyk, 16-0(12) has made no secret of his desire to move up in weight and try and accomplish that which only a very few fighters have been able to manage – namely win the world cruiserweight title (or titles) and then win the heavyweight title (or titles). Usyk said a long time ago how he had set himself the goal of emulating the great Evander Holyfield. The tough and seasoned Takam, 36-5-1(28) will certainly be a good test for Usyk to begin his quest with. The 38 year old warrior from France has been in with a good number of quality heavyweights and he has almost always made his opponent work hard, hard, hard to get the win. Guys like Alexander Povetkin, Joseph Parker, Anthony Joshua and, most recently, Dereck Chisora had to dig deep in order to defeat Takam; while good fighters Tony Thompson, Mike Perez and veteran pair Frans Botha and Michael Grant were unable to send Takam home with a loss attached to his record. Usyk, so much the fresher man, will be fully expected to beat Takam in May but the Ukrainian could be made to answer some questions along the way over the 12 scheduled rounds. If Usyk can manage to stop Takam, becoming just the fourth man to do it (and bear in mind the quality of heavyweights that managed the job: Joshua, Povetkin and, in completely turning the fight around, Chisora), he will have made quite the impressive heavyweight debut. A distance fight might well be a more accurate prediction for this one. Good on Usyk for tackling a live foe in his first adventure in the land of the giants.